Operation Organization: Professional Organizer Peachtree City, Newnan, Fayetteville, Senoia,Georgia: Sending Greeting Cards Just Got SO Easy! Sending Greeting Cards Just Got SO Easy! Would you agree that sending personal notes in the mail is a lost art? When was the last time you sent or received a greeting card in the mail? If you DO send cards, who do you send them to? If you receive cards, who most often sends them to you? If you're like me, cards don't get sent very often. If you're like me, you've slowly resorted to depending on facebook to tell you when it's time to say 'Happy Birthday'. It's really no wonder why this is the case when you find yourself in a season of life where extra time and energy is limited. It takes time and planning to purchase both physical cards as well as postage in order to mail out. It takes effort and intention to keep stock of and store a variety of cards for multiple occasions, not to mention finding a place to store them in the home so it's easy to find when you need them. And, of course, you need to actually remember to SEND the card when the time comes as well. However, if you're like me, you still sincerely ENJOY receiving cards in the mail, right? You still get a warm and fuzzy feeling reading appreciative or encouraging words chosen with you in mind, right? When you get a special note in the mail, it might even make you wish you had the extra time, energy, or resources to do the same once in a while. Wouldn't it be great to get back in the habit of showing appreciation and enriching the lives of important people in your life with a simple card in a more easy and affordable way (that will additionally prompt you to send the important greeting in a timely manner as well!) !? 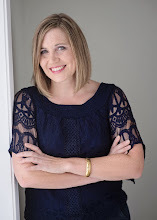 I was recently re-introduced to a company that accomplishes ALL that in one! With Send Out Cards, you simply choose or create a card from the comfort of your own home on line. Then, the company will print, address, stamp and send it out to your loved one the very next day!! A physical card will soon arrive in the recipients mailbox that has the capability to use either custom fonts or your own handwriting as well! There are over 18,000 cards to choose from. You're sure to find one to suit whatever occasion you'd like to honor. Or, you can custom design your card. My personal favorite feature is the ability to add your own photos! It instantly personalizes your message and makes it even more memorable! Another amazing feature is the capability to add a gift to be shipped with the card!! some love and appreciation to important people in your life? 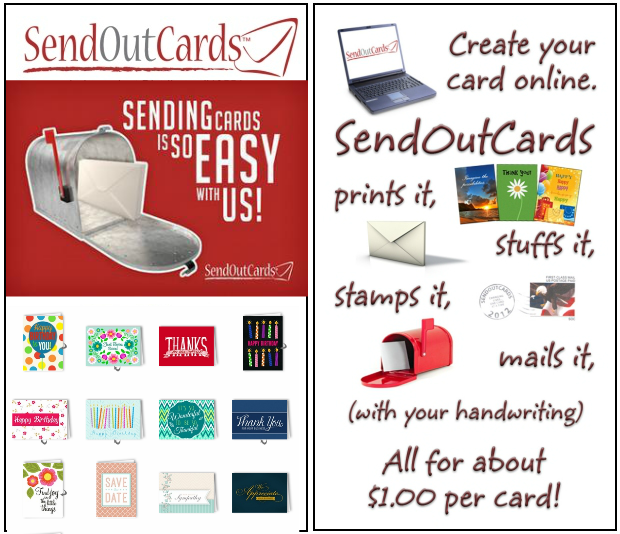 Yep - there is a Send Out Card App!! 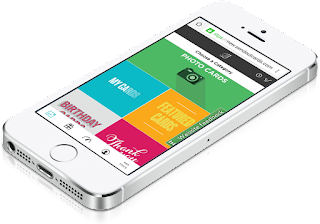 You can create a card, attach photos already available on your phone immediately when you're thinking about it! Download the app for free and log in to access your already established account. I recently visited and stayed with an out-of-state friend. It was a wonderful visit and my friend was the most generous and thoughtful hosetess. With the Send Out Cards App, it was so fun to send her a Thank You card with photos of our fun together the night BEFORE I even left! There are several payment options to choose from depending on the type and quantity of cards you want to send. Each type of card has a particular 'point' value and each specialized feature has an additional 'point' value. So, you begin by purchasing these 'points' to use as you choose. These purchased points are banked for an entire year from the time they are purchased. Do you enjoy sending Photo Greeting Cards for the Holiday Season? Send Out Cards currently has the best possible rate compared to other popular outlets particularly if you subscribe by the month and 'save up' the allotted points for special occasions. I was given a temporary complimentary account for the purposes of test driving this service. I only agree to review or endorse goods and services that I would consider using myself or suggest as a helpful solution to one of my valued clients. All opinions are my own. I'm now a BIG fan of Send Out Cards!